Despite the passing of Amendment 64 which legalized marijuana here in Colorado, Musta Been High refers to a rock climb- not the green stuff. Justen Sjong first climbed the route in 1999 on toprope calling it Knee Jerk Reaction. The first ascent on lead went to Eric Decaria in 2001 with the only permanent gear being one piton that is still in place today- thank God. There is a nice description of the route and a little history on Mountain Project. I’m known as a sport climber but I enjoy traditional climbing as well. 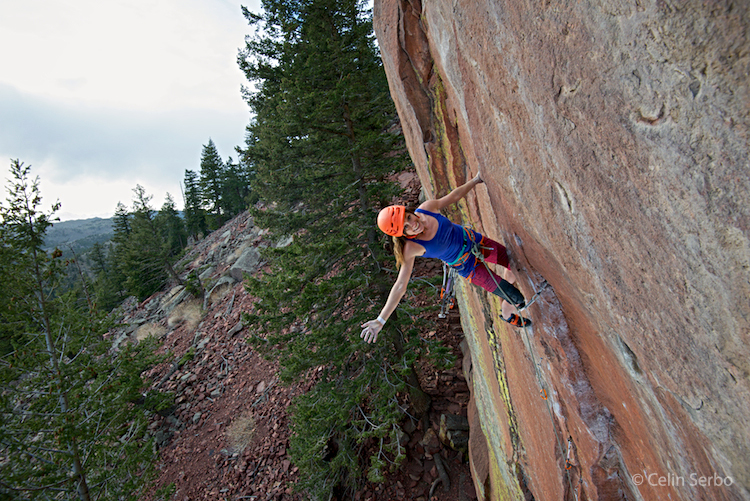 I first learned to climb outdoors in the fat crack country of Vedauwoo, WY, and have climbed a number of trad routes in the past, but none of them were super hard. I’ve just never focused on projecting trad routes. When I was working full-time I had to pick and choose my battles, and given I was based in Vegas, I chose to project hard sport routes, particularly steep limestone. And so that’s what I did. Now that I have much more time for climbing, I decided I wanted to return to my trad roots and dedicate myself to a hard trad project. Eldorado Canyon is practically in our backyard, just a 15 minute drive south of our home in Boulder. Chris recommended I try Musta Been High. He, Matt Segal, Matt Wilder, and Justen Sjong sent this route in 2008. 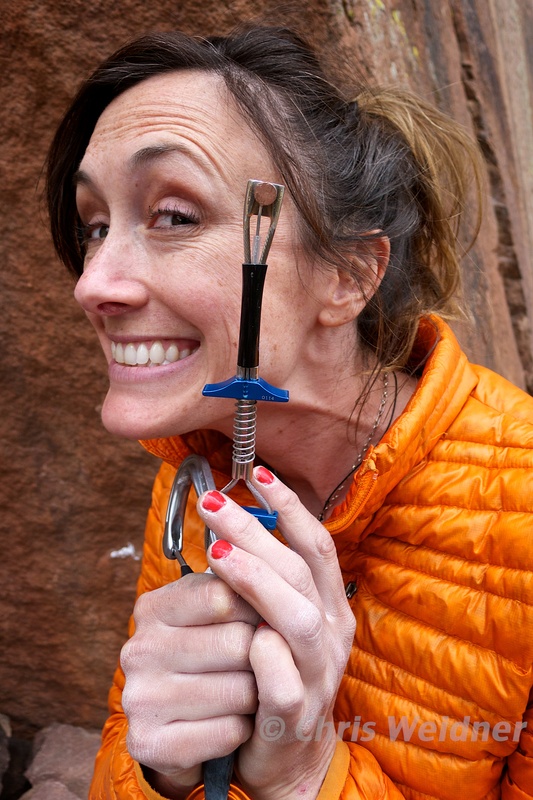 Here is a nice recap of their ascents (http://www.climbing.com/news/colorado-headpoint-gets-four-repeats-2/). Chris knows my strengths and weaknesses as a climber, and he thought this would be a good route for me to try. Turns out It climbs like a route in Rifle- slapping, squeezing, and knee-barring. Everyone is entitled to their own opinion, but I personally do not feel that wearing sticky rubber on your leg is in any way a form of regression in climbing. I think strapping on a knee pad is not any different than taping your hands before crack climbing. Sure it may make it easier and less painful, but it doesn’t take away from the sport- it’s just being smart. I like to think of knee-barring as another tool in your toolbox. Honing in on all different techniques can only help with your climbing and allow you to reach your true potential. So Segal went padless in 2008, and in 2014 I happily strapped my rubber knee pad on with duct tape- cinching it to the skin of my thighs, anticipating opportunities for several bar placements. But the first day trying the route I couldn’t even establish on the crux. It seemed as though there were no holds, just flat and wide squeezy pinches that were too big for my small hands. Just give me a down pulling crimp! I thought. Even the knee bars were wide, slippery, core-zapping and insecure. I looked down at Chris and thought- really? You think I can do this? As usual, he had more confidence in me than I do. So I put my head down and kept working. I whittled away at the climb, trying to stay positive with the smallest amount of progress, like figuring out a foot two inches to the left would keep me on the wall vs. making the move feel impossible. Sure enough, this focus and determination paid off. Over 8 days of work and on my 18th try (thank you for recording my tries Chris), it went down. And so you could say the 420s were good to me- meaning the month and days…come on! April 23rd was my birthday, and I had decided I wanted to celebrate my big day at the Rincon Wall. Chris surprised me with a birthday present- a blue Lowe-ball- the crux piece on the route. He wanted me to have a brand new shiny piece of gear for the lead attempt. I had a breakthrough day, toproping it clean for the first time. I practiced placing gear on TR and decided the next day out I’d give it a go on lead. The day did not start out well. There were wasps all over the route hanging out on my holds just waiting to sting me. I knocked a basketball-sized block off near the anchor during my warm up TR burn, nearly hitting Chris. And so where did I fall? Exactly where he said not to. I climbed through the toughest section and placed my birthday blue Lowe-ball a few feet above the fixed pin. My balance was off, I was pumped, and the next thing I knew I was in the air waiting for the piece to pop. It held! This little rattly piece of metal actually kept me from slamming onto the slab below. I think this gave me some confidence, and on my second lead attempt I sent! It’s healthy to step out of your comfort zone sometimes, and this year so far has been a huge learning experience for me. I still feel like a trad gumby, not knowing the difference between an RP and an HB, or a C3 and a TCU…but It’s motivating to have lots of room for improvement. And for now, I feel high as a kite … without the cotton mouth and munchies. Actually, I still have the munchies. The project is sent. I am going to go eat some chips now. Saying hello to the photographer after sending my first trad 5.13. My birthday blue Lowe-Ball that surprisingly held my fall on my first lead attempt of Musta Been High, 5.13c R.
Heather, great job on this climb and your most recent ascent on China doll. What brand of knee bar pad do you use and why do you use duct tape? Hey Stephanie! Thanks so much for the congrats and for reading:). I prefer to use the Rock ‘N Resole brand (based in Boulder). I use duct tape to keep the pad from sliding down. With technical knee bars, it’s key for the pad to not move or slip, so often I’ll use the duct tape as a constriction type wrap and/or tape it directly to my skin and the pad (it doesn’t feel good coming off- warning!). Sometimes in addition to duct tape I’ll use Mueller pre-tape adhesive spray directly on my thigh, too. It just depends on the climb and the knee-bar. Hope this helps and thanks again!